The Hits: About half as I see it, some of which you may own already, some I am certain you may have heard but don't actually own, and then a handful of great unknowns. "I'm a fat chap who likes playing playing records." Oh John Peel how we miss you so and what a great little quote to include in the liner notes to this compilation. While I am certain the title of this CD pretty much explains the premise of the collection I would like to toss in a few other notable quotes from the CD booklet as to why I think so many of us have a love for John Peel and why the spirit of this comp is so fantastic. "For the most part, Peel played pop from his own parallel universe, where major-label sales and showbiz demands counted for nothing. The show was all about the thrill of the new, the infectious optimism of DIY, and the chance of coming across a diamond in the rough that would last a lifetime. Above all, Peel was a champion of the underdog, whose natural gift - to us all - was to judge the noisy poetry of teenagers, apparent dreamers and outsiders on the same scale as the giants." "The idea here was never to try to mimic a typical 80 minute chunk of the Peel show which was ephemeral by nature - a mix of intimacy and observation, interspersed with music that couldn't have possibly come from a wider spectrum....Meanwhile I hope the unearthing of these unpop gems and playlist Nuggets might recreate something of the atmosphere of the Peel Show for his under-cover legions." I no longer have to dream what a sampling of Peels show in its prime may have sounded like. Here it is spread out over 80 minutes of what isn't perfection in the traditional sense of a greatest hits but I think that is exactly the point of this marvelous collection. Besides a healthy list of familiar favorites (The Vibrators, Young Marble Giants, Kleenex, Mo-dettes, Swell Maps...) there are more singles I wasn't familiar with (Tours, The Out, The Wasps, The Carpettes). 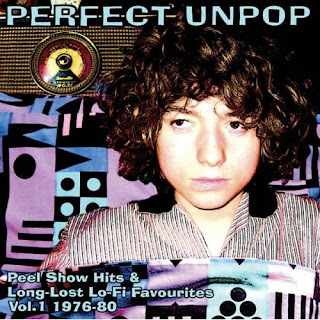 It isn't just another 77 punk comp or a C86 valentine, this stays true to the title's promise and is in fact a little sampling of everything from the late 70s that mostly flew under the radar but Peel placed a spotlight to. The liner notes also includes small articles on every record / artist featured on the CD and if there was anything to complain about all I can say is I wish this was magazine sized with a CD attached to the cover. The CD booklet is really that good and deserves something a little more special than just playing the roll of another comp CD that will probably get lost in the various artist section of your local record store.